Workbox redesigns websites. We refresh websites. We rebuild websites. Heck, we even revise and enhance websites! However you phrase it, probably 80% of our work is improving or rebuilding existing B2B websites. In other words, we’ve done it a lot and learned a lot from failures and successes. So, just for you, and based on our 19 years of experience, here are the three most important things you should do right now – from easiest to most challenging – when updating your B2B website. SSL makes Google happy. SSL makes your users happy. SSL makes your data happy. So why doesn’t everybody have SSL on their website? Some people find it confusing, but it can be very easy to enable if your site is a straightforward marketing site. If you’re an enterprise with all kinds of Microsoft network and DNS stuff happening, it can require a bit more work, but it’s still not that hard. Isn’t SSL just for ecommerce sites? No, it encrypts all data going between your customer’s browsers and your web server. This is important because regulators are getting tougher on hacked data across the globe, whether it’s something critical like a credit card number or as simple as an email address. So, what is SSL? It stands for Secure Sockets Layer (yeah, geeky blah blah blah). It encrypts your data as it moves from a browser to a server (even more geeky blah blah). But the important thing is that it adds a layer of security to your site if you collect user data (like in a lead-gen form). And it’s that little green closed-lock icon in your browser. A SSL certificate is something you buy. You follow a process with your website host. You may need your IT team or web developer to help you manage it. But, for the vast majority of businesses, it isn’t that expensive or very hard. Reality: a majority of your website’s visitors are going to be using a smartphone to access your website very soon (if they aren’t already). So, you need to do more than make sure your site is “responsive” – it needs to actually work well on a smartphone. This may mean that some of the page elements look or act a little differently on a smartphone than they do on the full website. One reason many marketing sites are lagging in smartphone design is that there’s a good chance that executives don’t access your marketing site on a smartphone – try it yourself and see what happens. Also, you may hear confounding phrases like “adaptive design” or “progressive enhancement.” Don’t worry about it. The point is that your site needs to work well for your customers on their smartphones. Take the time to understand how and why visitors use your site on a smartphone, then try to make it work for them. Goal: Speak your customer’s language in your site navigation. Example: One site we came across recently, Illumina.com, does a great job (they are not currently a Workbox client). Here’s how to think about this. When you ask a client, “What do you do?” use their answer in the navigation. 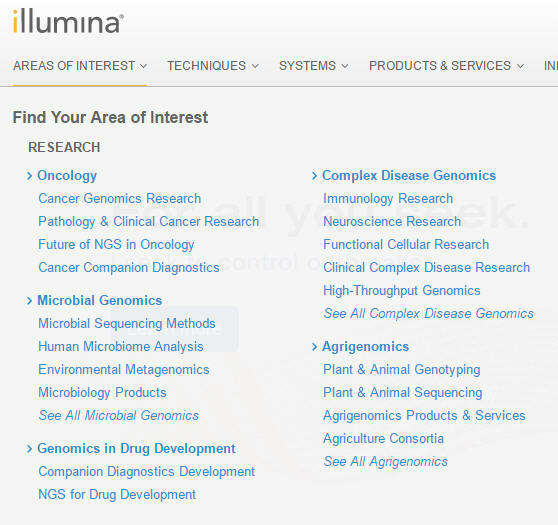 For Illumina, a client may say, “I do neuroscience research,” or “I am a neuroscience researcher.” Illumina put the words “neuroscience research” in the navigation. – First, customers see words they recognize and that apply directly to their jobs. They understand how your business helps them get their jobs done. – Second, it’s great for SEO because it more closely matches the natural way people search for solutions to their problems (solutions you offer and problems you solve). Why do we consider this the hardest of our three tips? Mainly because it can require a redesign of your site’s navigation and development of new content. Tip: When redesigning your site, choose a design and content management system that gives you enough flexibility to make this type of change. Also, it requires that you understand how your customers think about and use your products or services, and then translating that into your navigation and content. We often think more about our internally-focused categories and not about how they fit into customer’s lives. Who do I need to work with to get the SSL certificate purchased and installed? If one of our customers was on the bus and found our business online using her smartphone, what would she want to do or what information would she need most? Also, what would our business want her to do? Does your content and navigation make it easy for your customers to find content relating to their job responsibilities or issues they face at work? Fortunately, thanks to the beauty of modern content management systems (CMS), you don’t have to do all of this at once. You can add SSL now, start a redesign that includes smartphone optimization, and upgrade to a flexible CMS while you’re thinking about mobile users and creating content that matches your customer’s natural search patterns. In a few months, you’ll have a website that not only looks and acts great, it will also be easier to manage and improve the bottom line. I hope you find these tips useful and give you a head start when approaching a website redesign project. Please give us your thoughts, anecdotes, warnings and cocktail recipes!